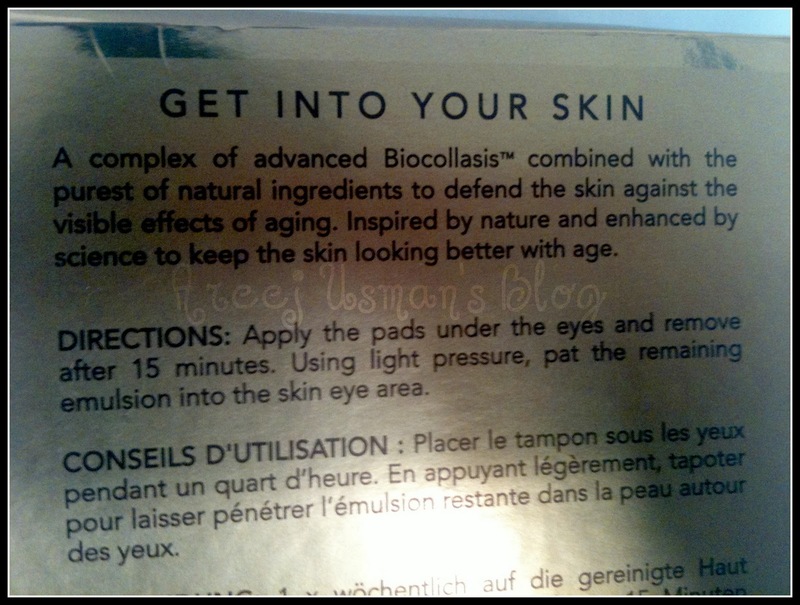 Today I am reviewing a product that can be a dream for many restless and tired eyes!Have you felt that your eyes are acting strange lately,they are puffy with some visible dark circles that take away all the freshness of the face.Then this product is the answer to your worry! 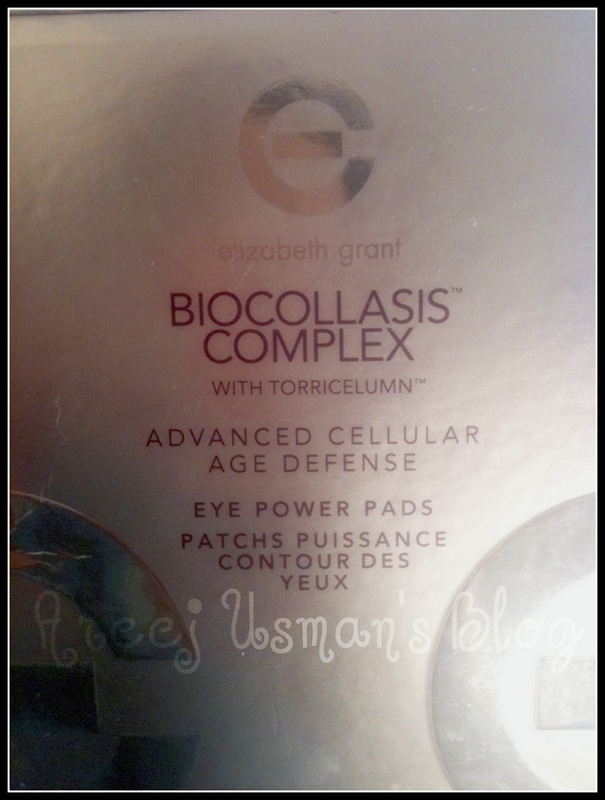 Presenting to you Elizabeth Grant Biocollasis™ Complex Advanced Cellular Age Defense Eye Power Pads. I was sent these a couple of weeks ago by the company for reviewing purposes. Elizabeth Grant did not always have the flawless skin she has today. Damaged during the Second World War, her skin was a constant source of personal shame and embarrassment – to the point where she avoided going out in public and living her life fully. All of that changed in 1948 when Elizabeth discovered a natural substance that was used to treat war wounds. 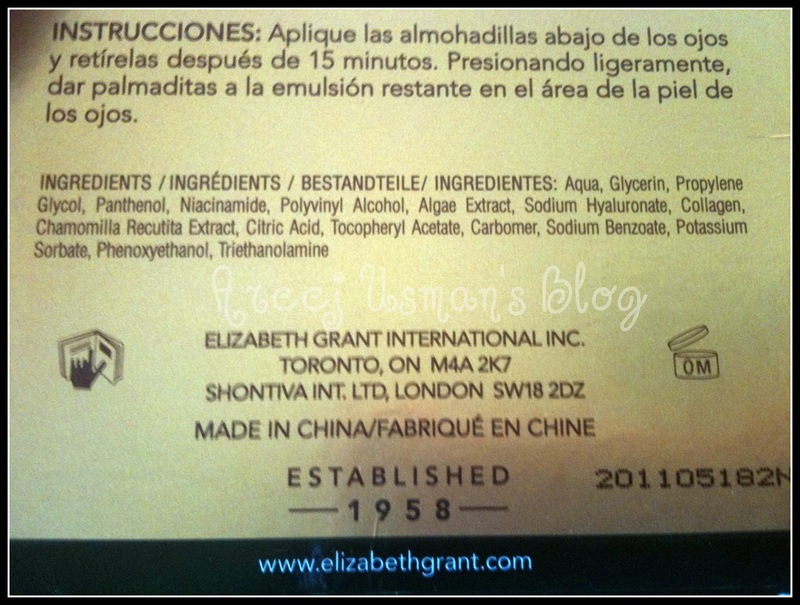 She had it specially formulated with other ingredients and began applying it to her damaged skin. Gradually, but very noticeably, the transformation occurred. Within eight months, Elizabeth’s skin had improved remarkably. She threw away the dark glasses and drooping hats that she wore whenever she went out in public…and started living again! On the strength of her miracle blend, Torricelumn™, and her own determination and perseverance, Elizabeth evolved the company from a home-based business to a multi-million dollar global corporation. Formerly available by special order only, the Elizabeth Grant line of skin care and beauty products is now available at select retail locations in Canada, United States, United Kingdom, Netherlands, Germany, United Arab Emirates, South Africa, Australia, Japan and Poland. 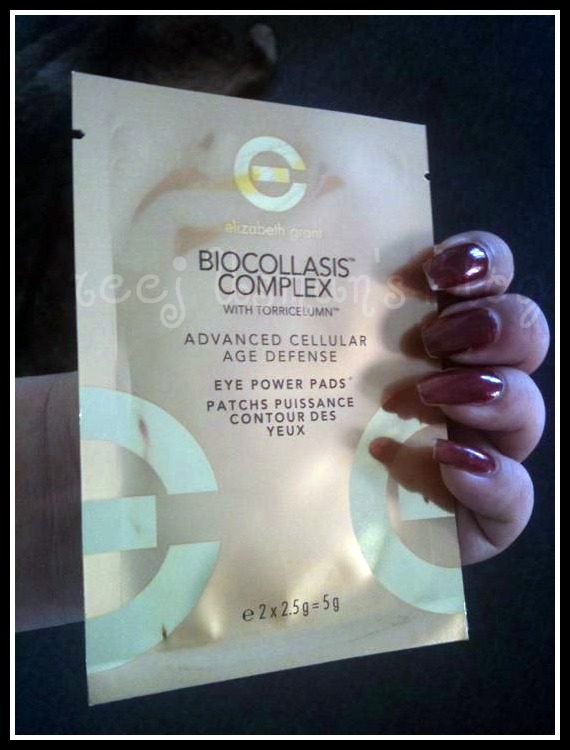 Aging well sometimes requires help – Biocollasis™ Complex Advanced Cellular Age Defense Eye Power Pads help to smooth out the appearance of lines and wrinkles around the eye area, reduce the look of puffiness and make dark circles appear lighter . 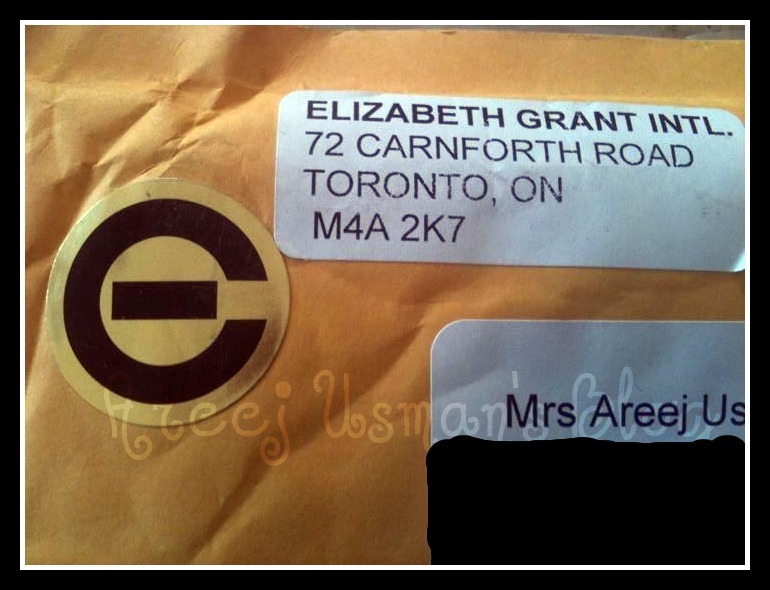 The Elizabeth Grant package came with the special company insignia on the envelope.Though it was a sticker but it actually looked personalized.I had one look at the package and I knew it was ELIZABETH GRANT! The pack contained six packs of the power pads.Each pack is meant for one time use. The packaging of the product and the packs give the feel of luxury and refinement.Each pack is perfectly sealed to enclose and sustain the freshness of the power pads. 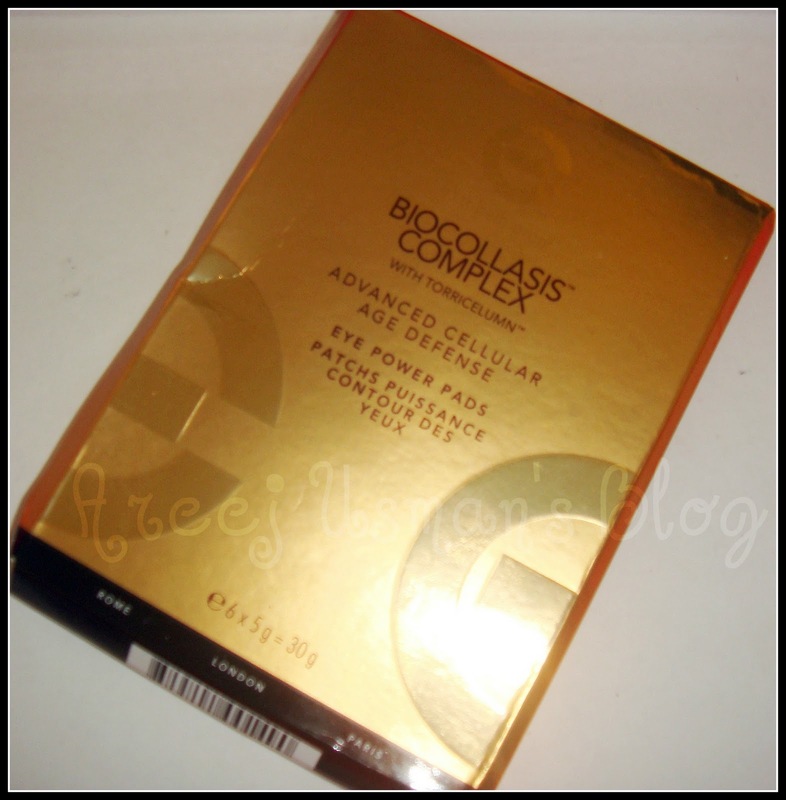 The Biocollasis Range from ELIZABETH GRANT is formulated specially for the skin. The pads that I have here are kind of softly sticking on my arm.Can you see that these are still damp.Infact they are quite wet actually & I must tell you these are after I have used them under my eyes for a period of over 15 minutes.I even kept them back inside the pack to reuse again because they have a lot of the gel on them.I have uptil now had five sessions of this treatment.They are very easy to use.Simply you have to stick them under your eye area where usually the eye bags are.There are how to use instructions on the back of each pack too.They come of very easily too. 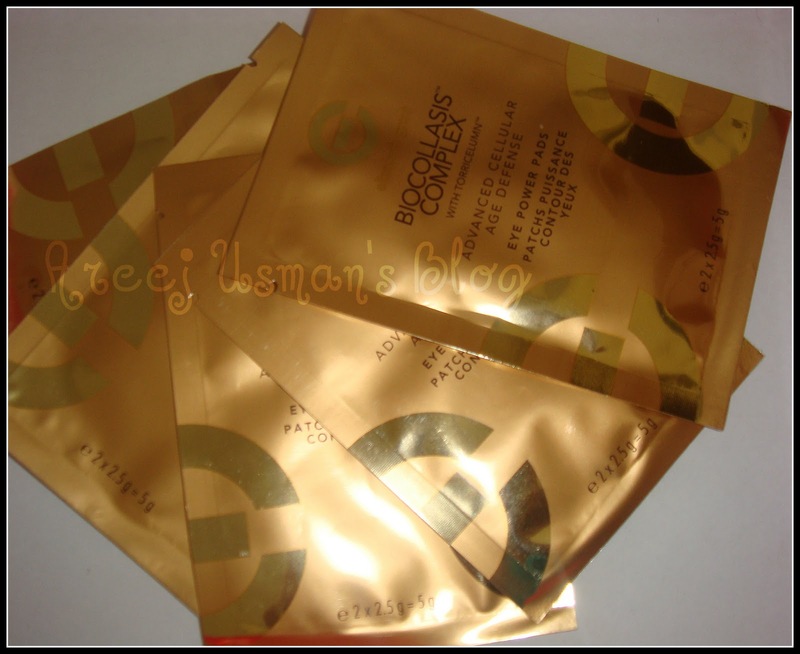 My experience with the eye pads has been really good.After using them for around 5,6 times now the area around the eye feels refreshed and relaxed.I would say that even after using it for a first time I noticed that the pads gave an instant freshness and a feel good factor to me.I am a person who doesnt have major eye bags problem,but I am pretty sure it will work out even better for persons with dark circles.The gel keeps the eye area hydrated and has lasting effects on the skin.Overall I am really satisfied with the results. This Advanced Cellular Age Defense Eye Power Pads 6 pack is available for $38. For more details,visit elizabethgrant.com.You can also find them on Facebook & Twitter. Any questions and comments are welcome. Great share 🙂 They look interesting, i wouldn't mind to try them out.. I enjoyed reading! great post hun!. btw, i followed you and i liked your page. let's keep in touch.. would love to read more from you! Areej I wanted to ask if you could review some perfect red lipstick shades?